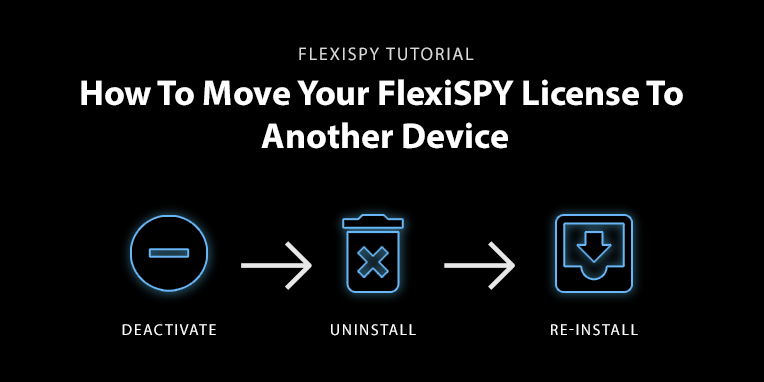 Follow three easy steps to move your FlexiSPY license from one target device to another without having to purchase a new subscription! Technology is always changing, and people love to have the newest and the best – especially when it comes to their mobile phones. FlexiSPY understands this, which is why a major benefit of our software is the ability to deactivate your license and move it to another target device as many times as you want during your subscription. So, if your child wants to the latest Samsung or your business decides to upgrade the company phone model, you can move your license from the original device to the new phone. Simply deactivate and uninstall FlexiSPY from the original target device and then physically re-install it on the new one. Let’s take a closer look at how this works. It is important to note that deactivating your license will delete all data from your online account and it will not be recoverable. Have no fear! FlexiSPY makes it easy to download your data safely to your computer for convenient viewing later. Check out this guide on how to download your data from inside your online portal. *If the device is not connected to the server, you can choose Send by SMS to uninstall FlexiSPY immediately or choose Send by Network to wait until the device connects to the server (this can take up to 1 hour). For more information regarding this process – as well as details about how to uninstall FlexiSPY on non-rooted Android devices – please view our Deactivation and Uninstallation manual in your online portal: Help > Reference Manuals > Deactivation and Uninstallation. To verify deactivation was a success, go to Account and scroll down to License Profile to see the status of your account. Activated Licenses appear as “Active” under Status, while inactive or deactivated accounts show up as Ready to Activate under the “Alias” menu tab. For this step, you will follow the normal process you used for installing FlexiSPY on the original target device. This will require physical access to the new phone. If you have need support in rooting or jailbreaking the new device – or for help with installation – you can also take advantage of our worry-free installation service. As you can see, FlexiSPY has made it easy to remove our software from one device and re-install it on another – without having to buy another license! If you are looking to monitor more than one device at a time, purchase another FlexiSPY license today!